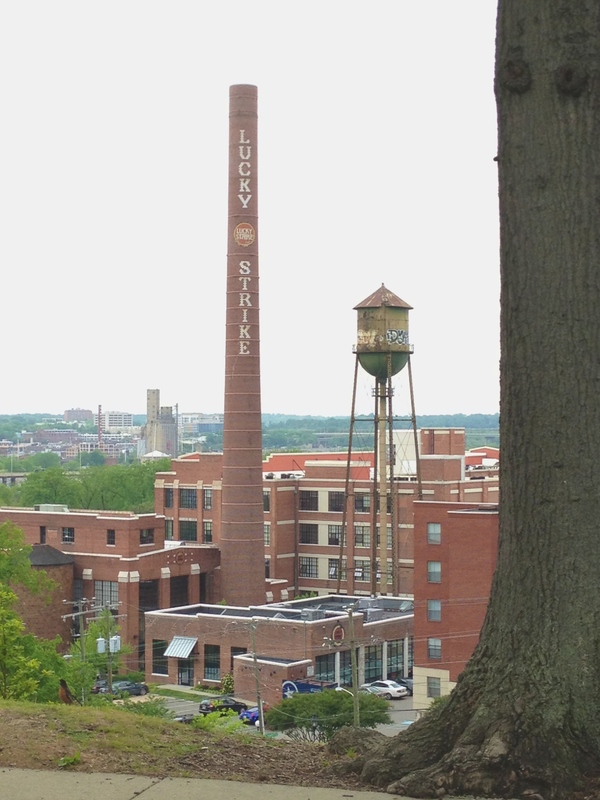 While attending the 2014 National Genealogical Society conference in Richmond, I took some time to check out my family connections to this beautiful, historic city. My first stop was Oakwood Cemetery, 3101 Nine Mile Road, Richmond. I photographed the headstones in the Askew plot, and the plat book showing the record of Askew family burials. 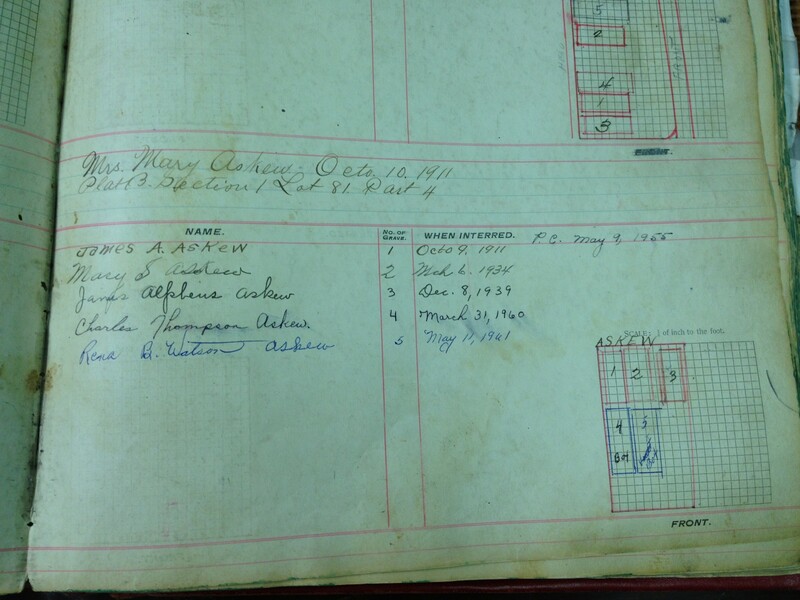 The plat book shows that Mrs. Mary Askew purchased the plot on October 10, 1911. The location in the cemetery is Plat B, Section 1, Lot 81, Part 4. The cemetery is huge! I would never have found the graves without the map and directions given to me by the very helpful cemetery office secretary. 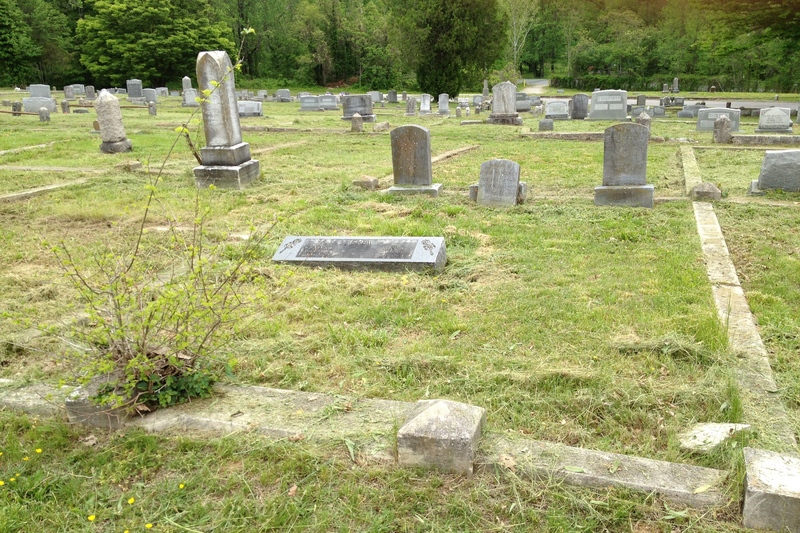 Here is the Askew plot – four headstones in an area outlined by a granite curb. 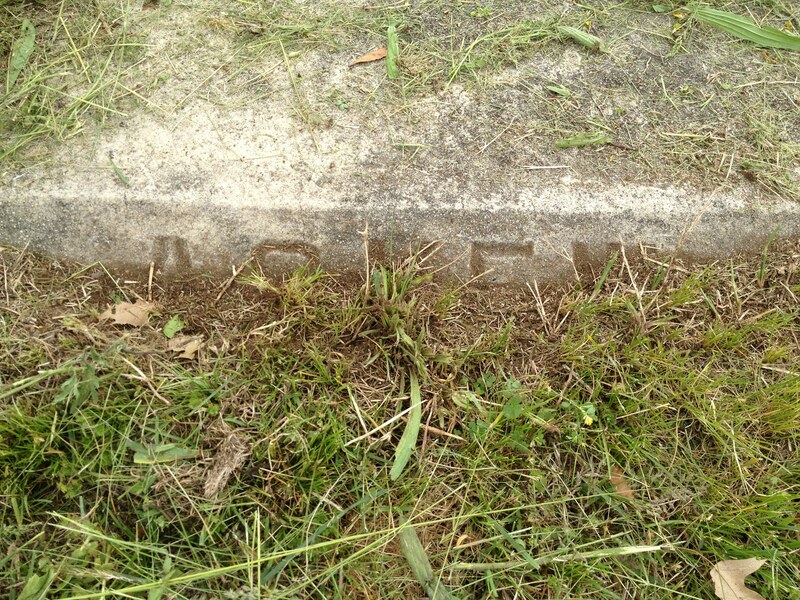 The front of the plot is marked with the Askew name, almost completely hidden by the encroaching grass. 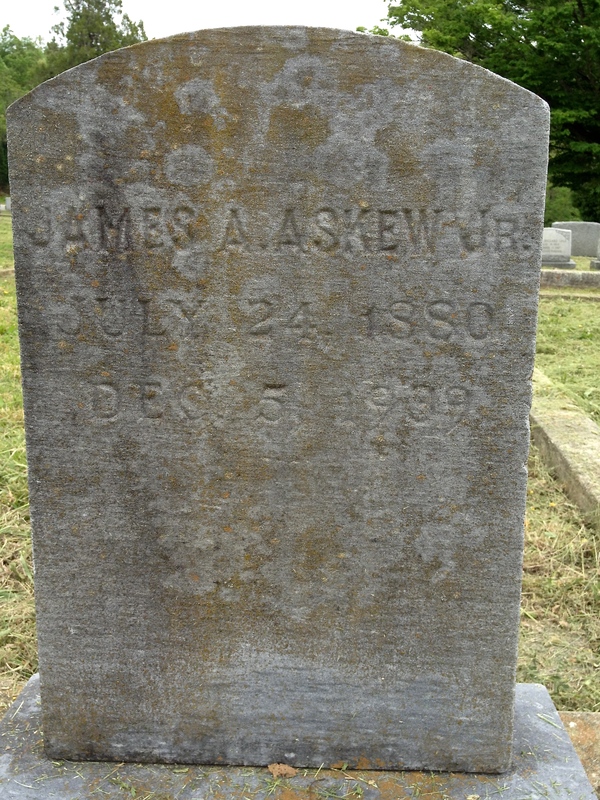 The first burial was James A. Askew (Mary’s husband and my great-great-grandfather) on October 9, 1911. Difficult to read due to the growth of lichens on the headstone, it says that he was born September 17, 1856 and died October 7, 1911. 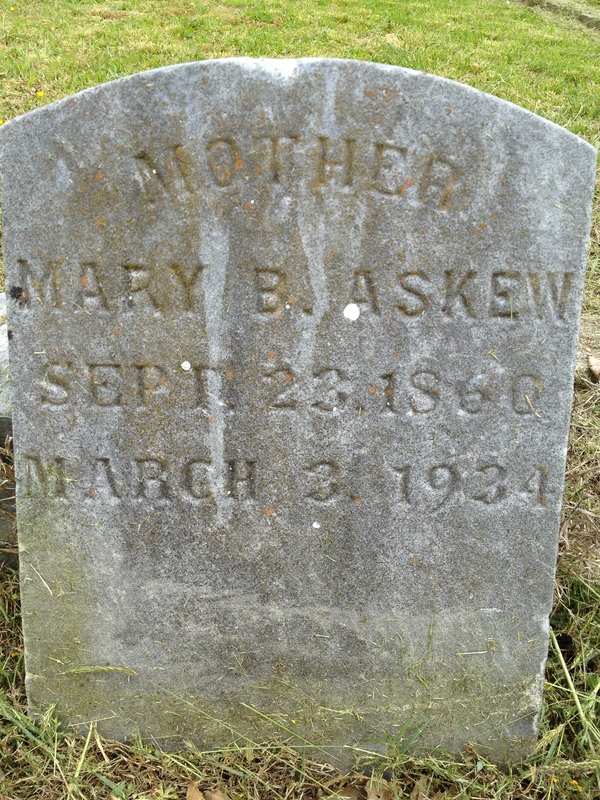 Next to be buried was Mary B. Askew (his wife) on March 6, 1934. This headstone has fallen off its foundation. 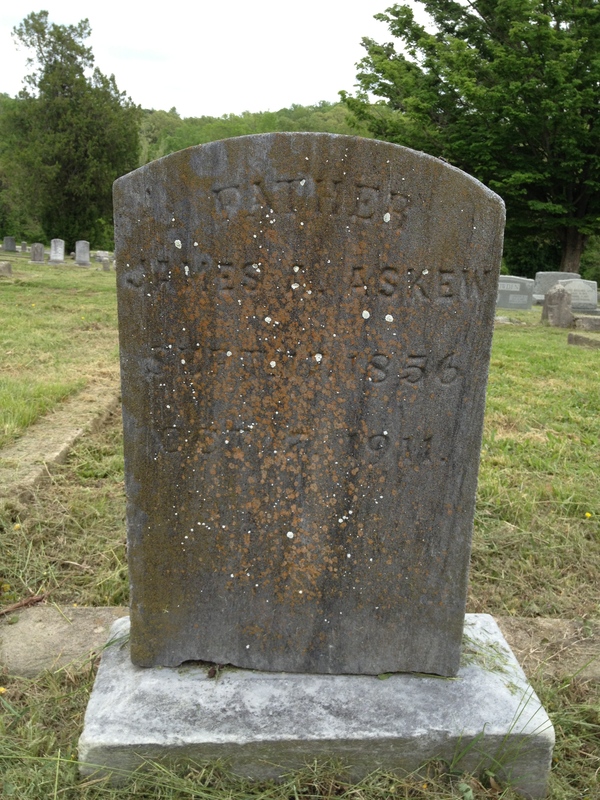 James Alpheus Askew, Jr. (their son) was buried five years later, on December 8, 1939. The last two were just one year apart: Charles Thompson Askew (their son) on March 31, 1960, and Rena B. Askew Watson (their daughter) on May 11, 1961. The neighborhood where the Askews lived was nearby, so my next stop was the home of James and Mary Askew at 105 North 29th Street. The sidewalk in front of the house was being replaced and a huge city truck blocked a good view of the house and prevented me from taking a photo. 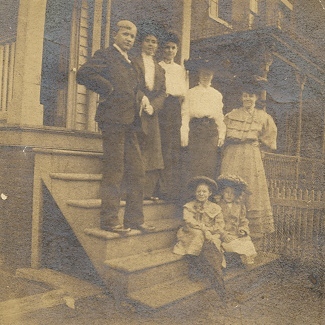 Here is an old photo (courtesy of my uncle) of the Askew family standing on the steps of that house. We believe that the people in this photo, clockwise from the left, are Robert L. Askew, his wife Martha Ellen Gilliam Askew, his mother Mary Bullock Askew, and his sisters Mabel, Jennie, Rena and Emily. And here is that same view in a photo taken by my uncle on his trip to Richmond. I spent some time wandering around the neighborhood. Less than a block from the house is Libby Hill Park (formerly called Marshall Square), one of the three original parks in Richmond according to the Richmond.gov website. From this view standing in the park, you can just barely see the former Askew house (light green) to the right of the tree behind the fountain. 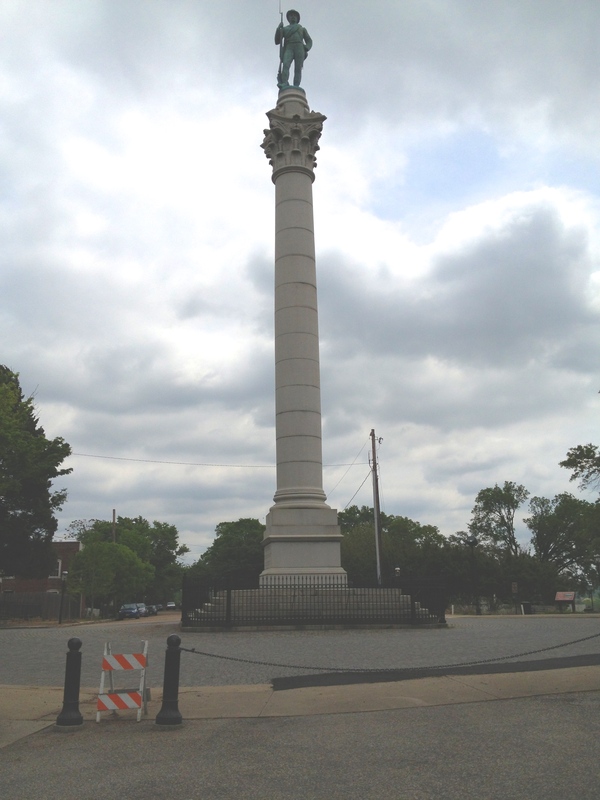 The park features a monument to the soldiers and sailors of the Confederacy erected in 1894. 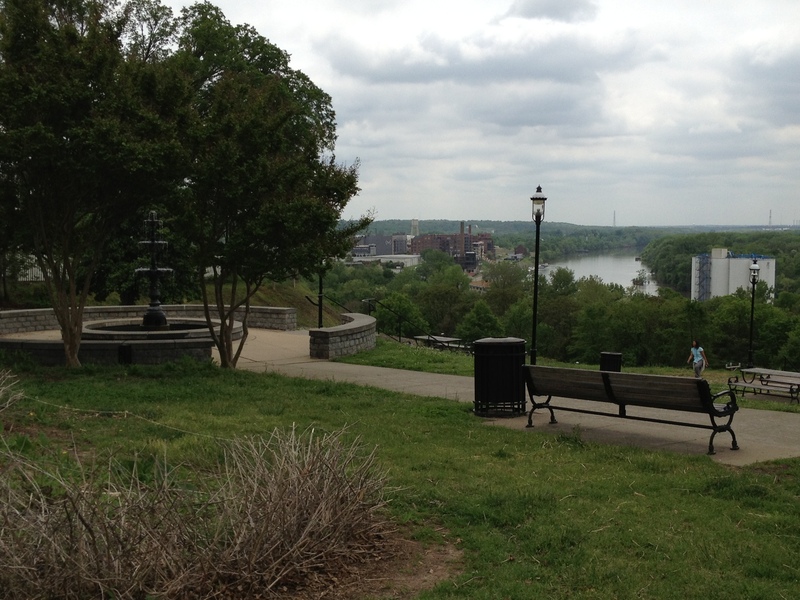 It’s a beautiful park with a breathtaking view of the James River. 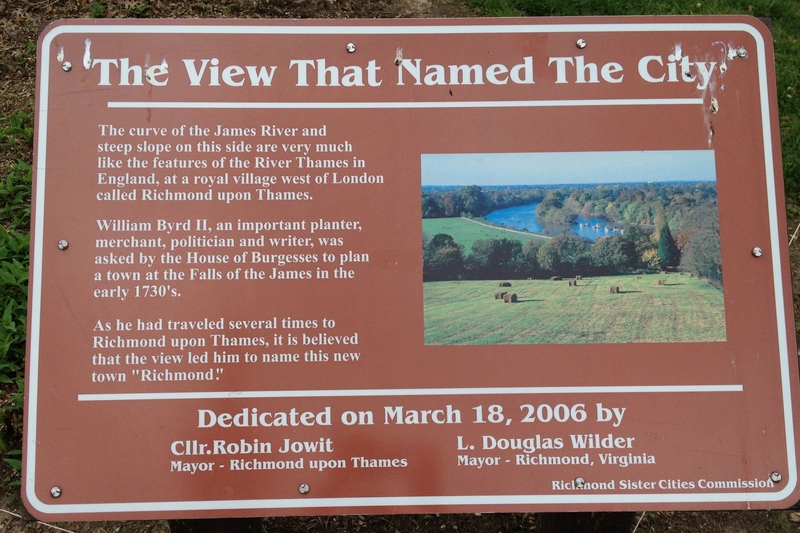 According to a sign in the park, it was this view that inspired the city to be named Richmond. I can imagine the Askews strolling down the very same cobblestone streets where I took these photos. 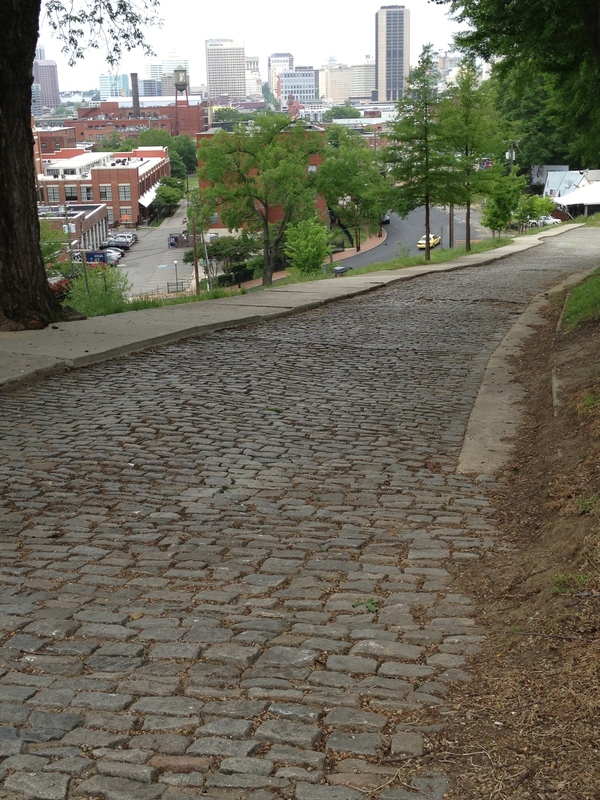 This street leads down the hill from the park to Tobacco Row. Here is another view from the park. There is a wonderful vintage map of Richmond here. You will find the area where the Askew family lived near the right edge of the map. 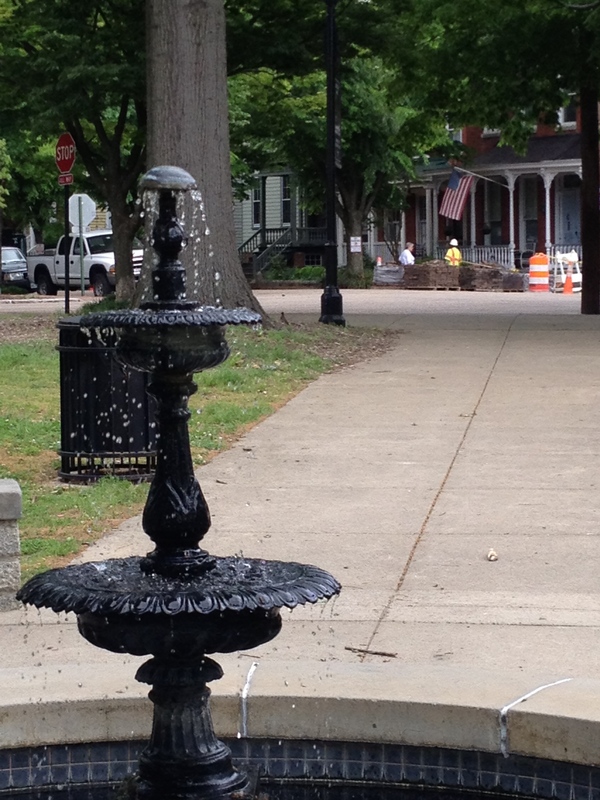 Look for the intersection of North 29th Street and Franklin Street. The map, circa 1909, shows the area as it was when they lived there. I had a wonderful time exploring Richmond and walking in the footsteps of my ancestors. 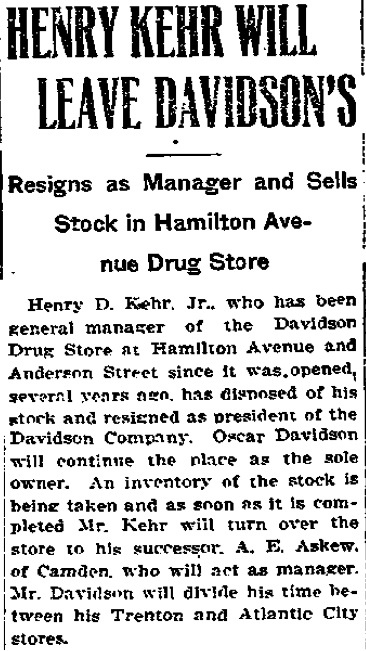 It seems he rose from being a clerk in a drug store to a druggist in his own business. This was the last evidence I could find for Thomas in Baltimore. An 1894 city directory for Wilmington, Delaware, listed “Askew TS, druggist.” At first, I wasn’t certain whether or not this was, in fact, the same person. Some evidence I discovered recently, however, proves it was. Where did Thomas go after that? It shows that they have been married for 14 years and that he is a drug salesman. They have two sons who were born in Delaware: Albert E., born in May, 1891; and Frank L., born in May, 1897. I haven’t had any luck finding a birth record for Albert, but I did find one for Frank. He was born in Wilmington, Delaware on May 1, 1897. It also shows his mother’s maiden name is Sadie Young. Could she be related to the Albert W. Young listed as a druggist at Askew & Co. in the 1893 Baltimore directory mentioned above? It seems likely, but I don’t know for certain. Searching Delaware records, I also found that Thomas and Sadie had a daughter who died at age 2. According to the death certificate, her name was Edith Young Askew. She was born in Baltimore, Maryland. She died on June 17, 1890 of meningitis. 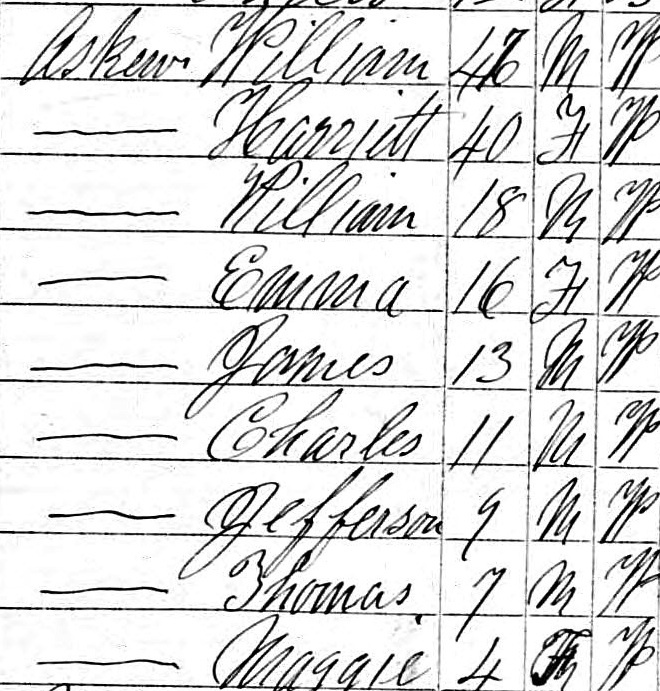 For some reason, I haven’t been able to find this family in either the 1910 or 1920 federal census. This meant turning to other sources for clues to their whereabouts. Once again, books available online in digital format provided answers. Just as I found clues about Charles Askew by searching in publications about his occupation as a paper salesman, I turned up valuable information about Thomas in pharmaceutical materials. A publication titled Practical Druggist and Pharmaceutical Review of Reviews, Vol. 21-24, pg. 585, which I found at http://www.books.google.com, in the section dated December, 1908, lists Thomas S. Askew as a registered pharmacist, having passed the New Jersey Board of Pharmacy exam in October. Now that I knew where (and “when”) to look, it was easy to trace the family in city directories. 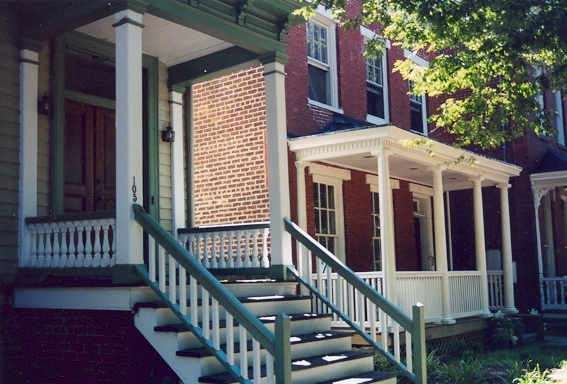 A city directory for Vineland, New Jersey lists Thomas as a druggist and Albert as resident manager at 712 Grape Street. In 1910, the whole family appears in the Camden city directory. Their address is 835 N. 2nd. The 1915 Camden city directory shows that, by then, the family had moved to 419 State Street. Albert is listed as a drug clerk. On June 5th of 1917, Albert registered for the draft. 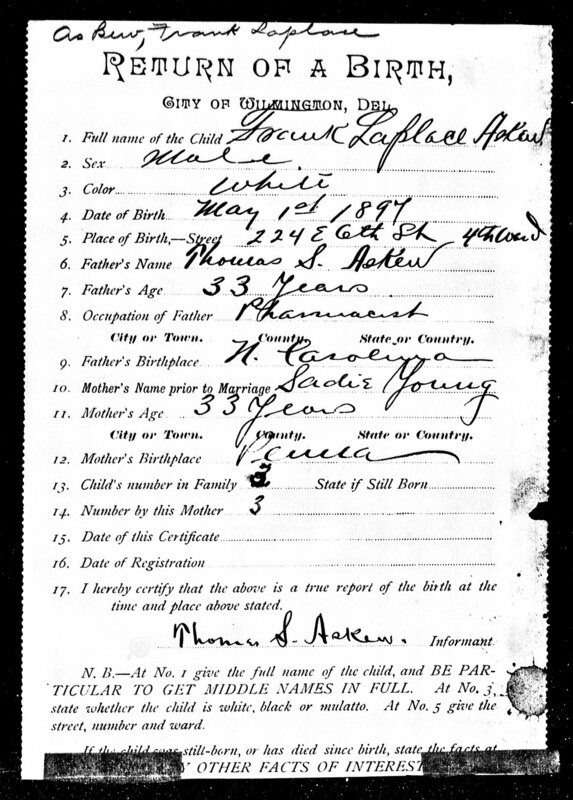 His registration card lists his age as 26 and date of birth as May 4, 1892. (This differs from the 1900 census, above, by one year.) His home address is 145 State Street, Camden, and he now works as a pharmacist for J. T. Kelly in Hammonton, New Jersey. He is married. He is tall, with blue eyes and black hair. The Camden city directory for 1917 shows that Thomas and Sadie continue to live at 419 State Street. Exactly one year later, his brother, Frank, registered for the draft, too. His registration card lists his age as 21 and date of birth as May 1, 1897. His home address is 418 N. 2nd, Camden, and he works for the Electro Dental Company of Philadelphia. He is medium height, with light blue eyes and brown hair. Interestingly, he lists his mother as his nearest relative. Also, he reports his middle name as “Young,” although it is shown as “Laplace” on his birth record. Why the change, I wonder? We know what happens to Albert later in 1918. In fact, the address where his funeral was held is the same as the address that Frank lists as his home address on his draft registration. Albert’s widow, Florence, moved to San Francisco after his death, and appears there in the 1925 city directory. Something happens to Thomas between 1917 and 1920, but I’m not sure what it is. He may also have died of the Spanish flu, but I have been unable to find a death record for him. The 1920 Camden city directory lists Sadie, but not Thomas. She is living with Frank. One day I may be able to solve this mystery in the New Jersey archives. Are there any living Askews from this line? Albert and Florence had no children. I have no record of Frank after 1923. So, for now, it seems the story of my great-great-great uncle Thomas and his family has come to an end. Between the start of “flu season” and the middle of October, nearly 7000 people in Camden, New Jersey fell ill with the flu. By October 19th, 615 of them were dead. Across the river in Philadelphia, the death toll climbed quickly past 700. No epidemic of this magnitude has been encountered before or since. One unfortunate victim, Albert Emerson Askew, succumbed to the flu on October 23rd, during the Spanish flu pandemic of 1918. He was 27 years old. 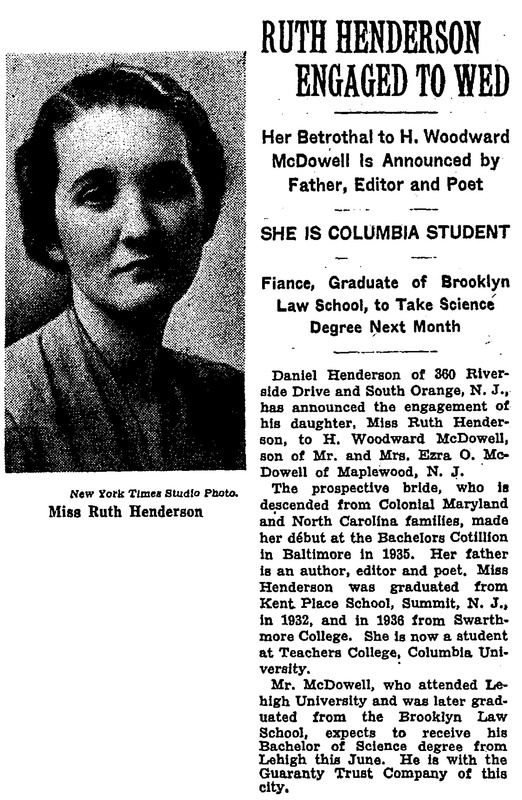 According to his obituary, published in the Philadelphia Public Ledger on October 25, 1918, he was survived by his wife, Florence Patterson Askew; his father, Thomas Askew; and his mother, Sadie Askew. A funeral service was held at the home of family friend William E. Comley, 418 N. 2nd Street, Camden. Interment took place at Riverview Cemetery in Wilmington, Delaware. In 1918, the Spanish flu caused an estimated 675,000 deaths in the United States alone. The worldwide death toll may have been as high as 50 million people. 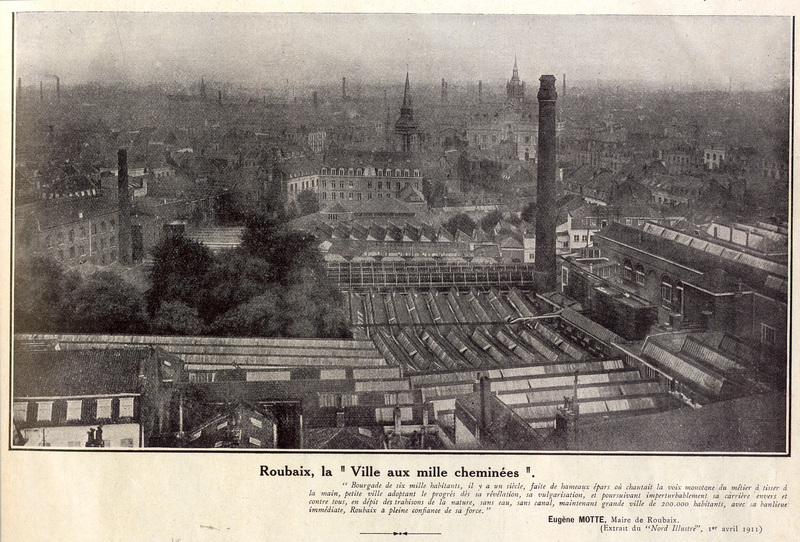 It killed rapidly, often overnight, as infected people suffocated when their lungs filled with fluid. Some reports indicate a bloody froth spilled from their mouths. Secondary bacterial pneumonia infections were common. Those in the age range of 20 to 50 had the highest mortality rate, which is somewhat unusual for the flu. At the time, Philadelphia’s population numbered approximately 1.7 million. By October 25th, 150,000 cases of the Spanish flu had been reported there. The city morgue, designed for 36 bodies, overflowed with more than 500 dead stacked in the halls. Burials couldn’t keep pace. In Philadelphia, as well as in Newark, New Jersey, and other cities, the dead were sometimes buried in mass graves. Some of the first reported case of the Spanish flu in the US occurred among a group of sailors in Boston at the end of August, 1918. By October 1st, the number of reported cases in Massachusetts exceeded 75,000. In New Jersey, more than 150,000 cases were reported, and by the end of October more than 4,400 people were dead. By contrast, this year Boston’s mayor declared a state of emergency when the number of confirmed cases of the flu reached 700 and 4 people had died. Public response to the Spanish flu epidemic seems to have been mixed. In some cities, public gathering places such as schools, theaters, and churches were closed, and people were encouraged to don gauze masks. Not everyone agreed with this policy, however. One Philadelphia newspaper accused authorities of trying to “scare everyone to death,” and relegated news about the flu to its back pages, despite the mounting death toll. Ultimately, Philadelphia had the highest number of deaths of any US city with over 12,000 reported. Most of these occurred within four weeks during the peak of the flu season. Still, many more people lived through the pandemic than died. 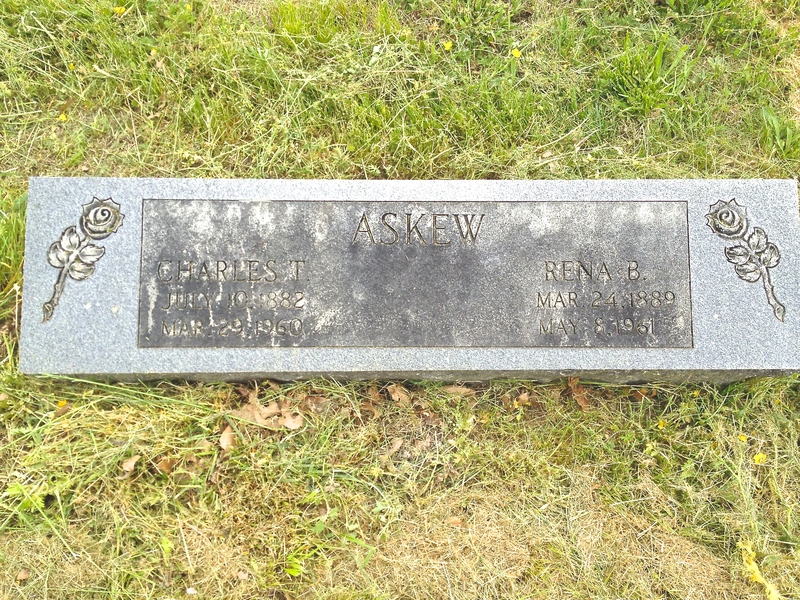 Unfortunately, Albert E. Askew wasn’t one of the lucky ones. The odds may have been stacked against him, though, because he would very likely have come into contact with many sick people. He was a druggist. In those days, the fledgling medical profession had neither the knowledge nor the resources to mount an effective battle against this virulent strain of flu. Also, many doctors and nurses were overseas taking care of the soldiers fighting in World War I, leaving fewer “trained” medical personnel to care for the sick. The pharmaceutical industry was in its infancy, with druggists creating and dispensing “cures” for many ailments. They were often sought out by the sick for medical advice and treatment. There was no cure for the flu, however whisky was often proscribed. Druggists were a source of supply even when public places, such as saloons, had been temporarily closed during the height of the pandemic. Where does Albert Emerson Askew reside on my family tree? I will tell you in my next post. Hint: we are 1st cousins, 3 times removed. If you don’t remember what that means, read this post again. Boston flu deaths for 2012-13 season total 6 before Jan 11th according to this article. Five were over 65 years old. 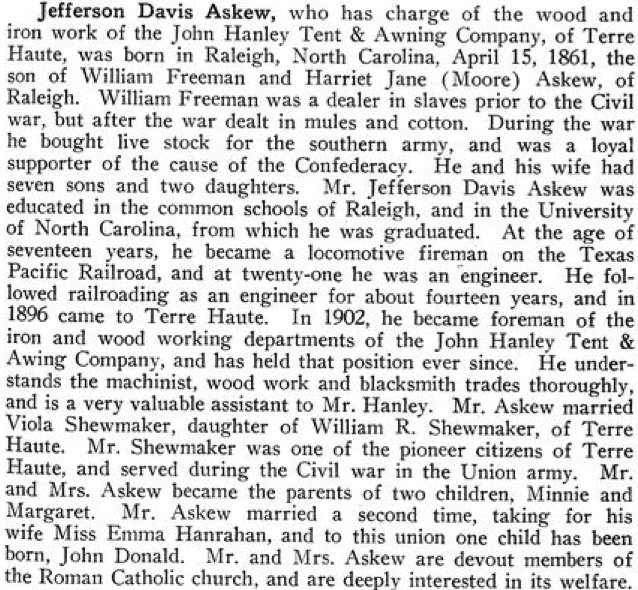 As the North Carolina State Fair ends today, it seemed fitting to post this tidbit regarding the Askew family and the history of the fair. 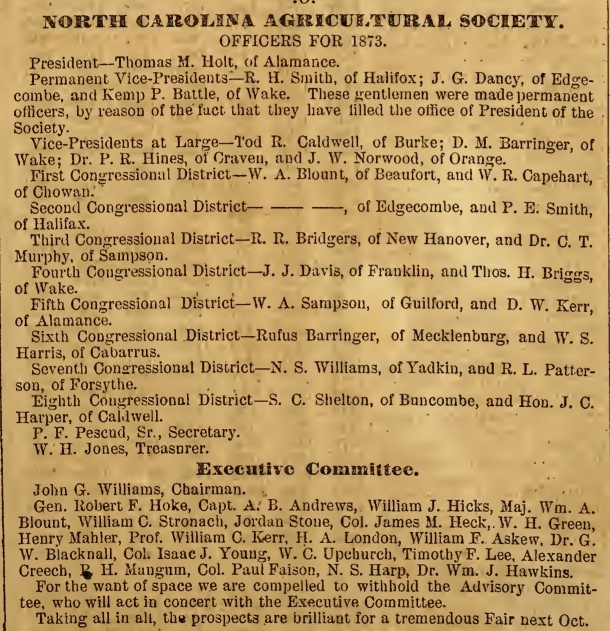 William F. Askew, my great-great-great-grandfather, served on the Executive Committee of the North Carolina Agricultural Society in 1873, when the State Fair moved from its original location to its second site in Raleigh, across from NC State University. It occupied approximately 55 acres along Hillsborough Road from Brooks Avenue to Horne Street, according to the North Carolina Department of Cultural Resources Highway Marker Number H-34. The Agricultural Society ran the fair until 1927 when the Agriculture Department took over and the Agricultural Society disbanded. 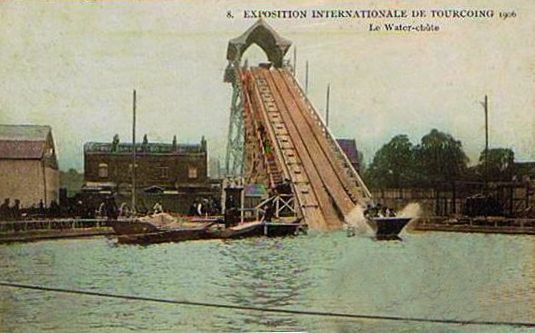 It moved to its present location in 1928. Here is an excerpt from the North Carolina Agricultural Almanac 1873, published by L. Branson. You will find William F. Askew’s name listed in the Executive Committee.